1) If the original poster changed their email address, it became impossible to reach them and discuss the family in question. Given that some of the query boards dated back to 1998, there were a lot of old email addresses up there. 2) The boards were difficult to navigate and browse. Site search and Ctrl+F were the only way to look through the boards for specific surnames or regions of interest. 3) Having email addresses listed on the site made it easy for spammers and scammers to contact posters through their personal email accounts, and the static boards allowed for no interaction except for email. Well, all of that has changed with the new and improved Cherokee Genealogy Queries section of the site. To help you get familiar with the new Queries section, this article will outline the different features and tools to help you post queries, browse queries, and interact with query posters. Before you can post a query or reply to a query, you must set up a user account with All Things Cherokee. It’s free and easy to set up. All you have to do is supply a username and email address, then you’re done. Your username can be anything you want it to be, and your email will not be revealed to the public, so your privacy is maintained. Once you’re registered, just login. You can do this from any page on the site using the User Account feature on the top right of each page. Once you’re logged in, visit Cherokee Genealogy Queries to post your query or to browse and reply to the already posted queries. In the Submit a Query section you’ll see a simple form with four fields: Query Title, Query, Regions, Surnames. Query Title and Query are required fields, but Regions and Surnames are not, however they are HIGHLY recommended. Here’s more about what each field is used for, and why they’re important. The Query Title field will appear with your query on subpages as well as in the search results. This is where you can summarize your post with a quick one liners. Such as: “Researching Mary Elizabeth Taylor (1856-1902) Washington County, AR” This level of detail helps other researchers to know if this is the same Mary Taylor they’re researching, or not. The more you can differentiate your query, the more success you will likely have in finding fellow researchers looking for the same ancestors. The Query field is where you can write as much or as little as you want about the ancestor(s) you’re researching. The more detail you include here, the better. A good query will include lots of names, dates, and places because this helps other researchers to know if you’re both researching the same person. Just posting a single name in the title and something along the lines of “I’m trying to research my family” in the query section gives very little information to other researchers, so they will be less likely to contact you with research ideas or suggestions. The Regions section is a selection menu which includes each of the 50 states. You can select as many states as you want (hold the “ctrl” key down in order to select more than one state). Be sure to only select those states where your ancestor lived, otherwise it’s pointless. This is not a required field, but it is highly recommended because it will allow researchers to find your query when they are browsing by region. The Surnames section allows you to list all of the surnames included in the query. This is not a required field, but it also highly recommended because it will allow researchers to find your query when they are browsing by a specific surname. Once you’ve completed your query, hit the Submit button. Your query will then go into review, and I review all queries before posting them. This is to avoid having the query boards cluttered with spam. This review process takes anywhere from a few minutes to a day or so, which is a vast improvement over the old boards where queries were collected and all were posted just once a month. 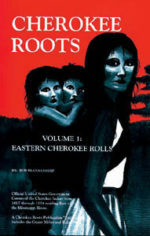 When it’s reviewed and published, then your query will appear on the main Cherokee Genealogy Queries page, as well as on the Region and Surname pages according to the entries you made in those fields. The queries are public and will appear throughout the site and within search results, so be sure you don’t post any information which is private. Once your query is visible to the public, others will be able to reply to your query and you can interact with these other researchers in a publicly visible conversation thread right on the page with your post. There are several ways to locate query posts within the Cherokee Genealogy Queries section: Search, Browse by Month, Browse by Region, Browse by Surname. All of these navigation features can be accessed on the right navigation bar of the query pages. This is a simple keyword search of the entire site, including the Cherokee Genealogy Queries. This is a good way to search for specific ancestor names to see if any other researchers are looking into the same person and have already posted a query. Each month all of the queries posted that month will be bundled into an archive page. This is a handy way to see all of the queries posted over time. These pages will list all of the queries which listed a specific state in the Region section of the post. If you are a researcher looking at ancestors in Tennessee, then you can quickly browse all of the queries which have been posted with links to families in Tennessee. The Surname browse tool is probably the most useful because it allows researchers to look for their specific family name and see all of the other posts which included that surname. In addition to the Browse tools on the right navigation bar, you can also browse by Surnames and Regions from the query posts themselves. Browsing the query posts on All Things Cherokee has never been so easy. And interacting with the query posts is now easier than ever as well. Once upon a time, when you wanted to communicate with a query poster or with others within the All Things Cherokee community, you had to email them. This sounds simple enough, except that over time email addresses come and go and many users found is frustrating when they were unable to make a connection. Well, that’s a thing of the past. Now, if you want to reply to a query with a question or a comment, all you have to do it leave a reply on that query page. With the new Query Board set up, each and every query has its own web address, so users can post a query and then others can reply directly to you on the query page. Additionally, you can share a query post on social media or send it via email if you want others in your family to see it and perhaps post their own thoughts to the comment thread. So there you have it, the tools and tips for using the new and improved Cherokee Query Boards at All Things Cherokee. I hope that you will post and interact with others, helping the boards to grow and thrive.